Can inner-city crime be significantly reduced? Efforts to reduce violent crime are succeeding in some, but not all, areas of the country. 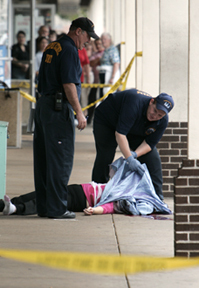 The number of violent crimes fell by about 2 percent during the first half of 2007. But crime still grips parts of cities large and small, where guns remain plentiful and many young men are caught up in a cycle of attack and revenge. In Washington, D.C., for example, there were 181 killings last year, up from 169 in 2006. But in the capital and elsewhere, homicide rates are significantly lower than during the crack cocaine epidemic of the 1980s and early '90s. Experts attribute some of the improvement to better policing techniques, such as closely tracking neighborhood crime and quickly responding to upticks. But a countertrend of persistent violent crime is plaguing impoverished inner cities, where city officials and grassroots activists are struggling to keep young men from joining the ranks of victims and perpetrators.